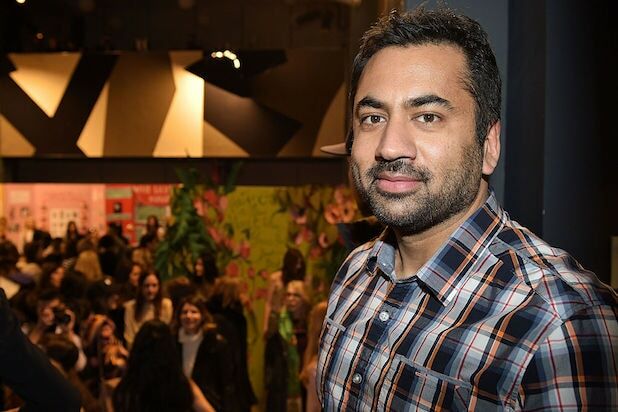 Actor Kal Penn may have just come up with the most awesome way to clap back at his Twitter haters. 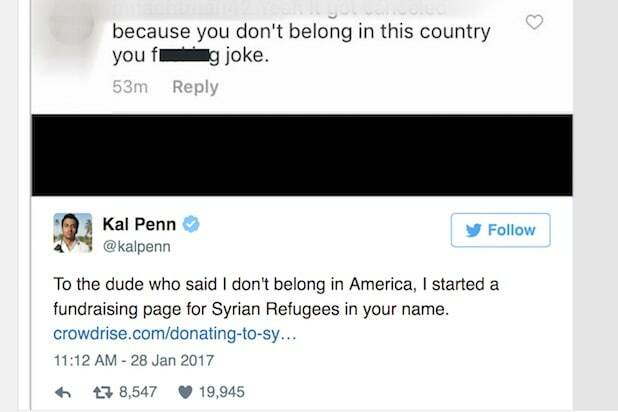 The actor created a fund-raising page for Syrian refugees on Friday after a Twitter user trolled him on the social network, saying that Penn didn’t belong in the United States. The page has already raised more than $642,000 (and counting), meeting its initial goal of $2,500 in just minutes. It started after Penn got a call from a friend whose father, an Iraqi refugee who had worked with the U.S. military, was not allowed to board his flight. “I tweeted it out,” Penn said. A racist dig from a hater who told the “Harold & Kumar” actor he didn’t belong in the United States, got him thinking. The “Designated Survivor” star’s fundraising effort come as Donald Trump signed an executive order banning people from Muslim countries from entering the U.S. The order sparked demonstrations at airports around the country on Saturday. The 39-year-old actor, who served on Obama’s Committee on the Arts and Humanities, is one of a long list of Hollywood players who have come out against Trump’s Muslim ban. Penn was born in Montclair, New Jersey, to Gujarati immigrant parents and is a U.S. citizen. Friday, May 26 marked the start of Ramadan, a month of fasting in the Islamic religion to mark the first revelation of the Quran to Muhammad. 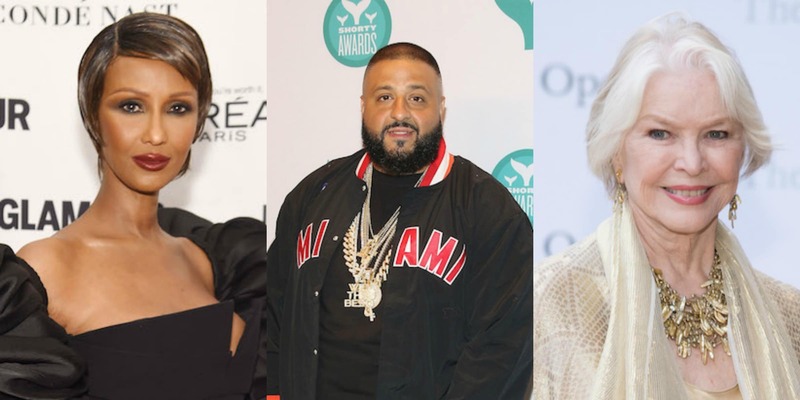 Here are 15 celebrities you might not have known were Muslim. The former One Direction singer hasn't been too vocal about his religion. He garnered a worldwide trending topic #respectforZayn when Bill Maher compared him to the Boston Marathon bomber. The former N.W.A rapper has said, "What I call myself is a natural Muslim, because it’s just me and God. You know, going to the mosque, the ritual and the tradition, it’s just not in me to do. So I don’t do it." Burstyn was raised Catholic and then began her journey to Islam by practicing Sufi Islam. She won an Academy Award for Best Actress for her role in "Alice Doesn't Live Here Anymore." Better known as Dr. Oz, the TV personality hosts a talk show that discusses popular health concerns. Oz was named one of the 500 most influential Muslims in 2009 by The Royal Islamic Strategic Studies Centre, a leading Muslim group. The Somali supermodel (and widow of the late David Bowie) most commonly known as Iman is Muslim. Her name means "faith" in Arabic. She's said she considers herself Muslim even though she doesn't practice. The actor-comedian, best known as a former correspondent on "The Daily Show," has openly criticized the fact that he has to spend so much time defending his religion instead of engaging in open dialogue about it: "I have a complicated relationship with my own faith." The Chicago native isn't one to be quiet about his beliefs, but the fact that he's Muslim is something many might not be aware of. In an interview with Katie Couric in 2014, he addressed the struggles of being Muslim while in the entertainment industry. Muhammad Ali wasn't the only boxer who is Muslim. In an interview with Fox News, Tyson says "I'm very grateful to be a Muslim." He has also said "Praise be to Allah," in an interview following a fight. One of the most well-known comedians, Chappelle told Time Magazine in 2005, "I don't normally talk about my religion publicly because I don't want people to associate me and my flaws with this beautiful thing. And I believe it is a beautiful religion if you learn it the right way." The host of CNN's "Fareed Zakaria GPS" says he is neither a practicing Muslim nor is he very religious, but he self-identifies as Muslim nonetheless. The legendary soccer star most known for exiting his career with an infamous headbutt heard around the world, is Muslim. The Grammy-nominated artist is probably best known for rapping a mile a minute on some tracks. He has stated "I live my life by Islam and at the end of the day I think that's pretty much what grounds me." Better known now as Yusuf Islam, converted to Islam in the 1970s. Islam went on a pretty long musical hiatus after his conversion. The French actor, best known for his role as Bishop in "X-Men: Days of Future Past," is Muslim. He was also listed in the World's 500 Most Influential Muslims publication in 2016.